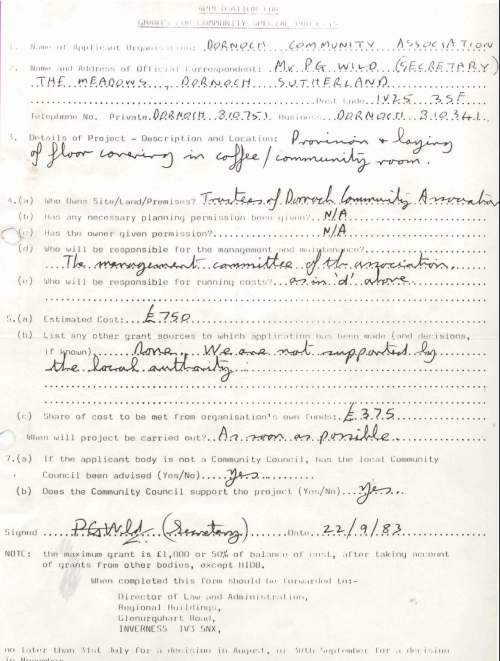 A bundle of Dornoch & District Community Association correspondence of July to September 1983. 14 miscellaneous pages ranging from A4 size to a cheque, including pink and white carbon copy paper, headed paper from Macdonald Associates Dornoch, 2 Northern Times clippings, HM Customs & Excise Clynelish, Dornoch Area Community Council, Highland Regional Council, Clydesdale Bank cheque and Highland Region and Western Isles Joint Valuation Committee. Content includes grant application for flooring of Social Club, lack of facilities for young people at Social Club, refurbishing of Social Club, restoration of war memorial and rateable value of Social Club.